This is Wally Berg and I am calling you from a very snowy Pheriche. We woke up this morning to see several inches of new snow on the ground and throughout the day it remains very grey and stormy here. That would not stop Dafna - our super trekker - and Mark who was also up for a hike today. The two of them along with Nima, our Sherpa guide, climbed a couple of thousand feet above Pheriche, to two of the viewpoints that we sometimes visit. No view today but good exercise for those who are always up for a little bit more of a work out. They returned for lunch and the rest of us, Amelie, Steve and myself were resuming our rest activities on our acclimatization day today. 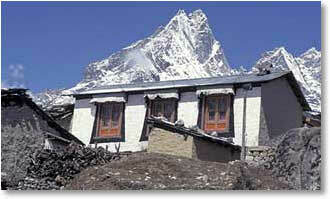 When we came in to town we were pleased to hear of the success of the Brazilian Team on Lhotse. I also saw a sherpa friend of mine Kancha from Khumjung walk through with a typically sun burnt and wind burnt face from a lot of time out on the mountain. He reported that the Korean team were on their way home. 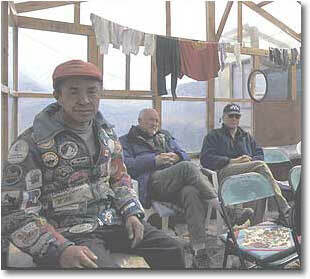 Everest was on my mind today because it is the 10th anniversary of one of my Everest summits. I was on the summit on October 10th 1992. Here in Pheriche I have enjoyed catching up with good friends that you remember from past dispatches, Namkha and Ang Rita, the sherpas who have been the caretakers of the Himalayan Rescue Association Clinic for years and years. Speaking of the Rescue Clinic. Steve was only in town for a few minutes before he returned proudly with an official looking peace of paper on a HRA letterhead with a prescription written from Eric Johnson - the physician this year - that the patient, that would be Steve, is advised to be on a daily dosage of Viagra and Mount Everest Whisky. I should explain that when we first arrived in Lukla, Steve spotted a bottle of Mount Everest Whisky and had to have it. I patiently tried to explain to him that it would be available throughout the trail. Mount Everest whisky is bottled here in Nepal, and none of us had ever actually tasted it, but has an appealing name and label. I explained to Steve but he had to have that first bottle that he saw. He continues to see at every teashop he passes but now he has a prescription from Eric Johnson to get daily dosage of Mount Everest Whisky.